Every New Year is a prime opportunity to set goals, and strategize ways to make our lives more fulfilling. In one way or another, we all want ‘success’, and the team at Success Talks have showcased its relative definition for the past 5 years. Success Talks organises for inspirational individuals to share their success stories and their last edition for 2017, hosted by UK Blogger, Breeny Lee, concluded with Model, Actor and one of the sexiest men alive as named by People Magazine, Broderick Hunter. 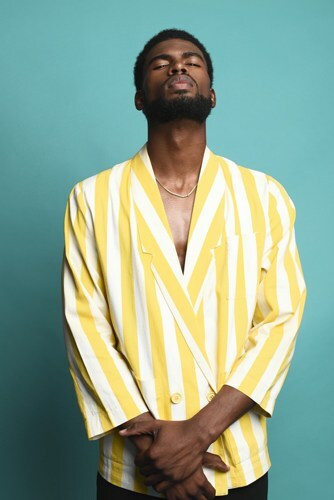 As an individual who is internationally recognised by British GQ Magazine, Buzzfeed and Cosmopolitan Magazine, as well as his more recent appearances in Issa Rae’s ‘Insecure’, Broderick Hunter took some time to have a conversation with us about his definition of success, what he wants to see more of in the world, and the ultimate advice for taking dope pictures. The process of learning any trait comes with a process and Hunter is not one for quick fixes when gaining skills and credibility “everyone always says ‘put me on’, ‘get me in the door’, and honestly, it’s possible but there’s no longevity behind it because there’s no work behind it. People just want the cake without having put it in the oven”. It’s clear that putting the time in is paramount in Hunter’s opinion and when reflecting on his career thus far, he smiles and tells us “I’m proud of everything. There’s not one job that I can’t say that was too big or too small, I am grateful for the blessings”. As a man who has no problems in front of the camera, we tapped into this modelling expertise and asked for some tips on how we too, can take incredible pictures. Instead of giving us 3 tips (like we asked), he gave us one, “stop giving a damn!“. According to Broderick, having a more careless approach to taking pictures is the perfect time to tap into our inner magic. Broderick explains that “once you find that self confidence, and reassurance for yourself, that’s when inner glow is going to show up, which is what we call black girl or black boy joy. It’s an inner joy that has nothing to do with anyone else’s approval”.